We had an interesting sermon this morning in a very snowy Canonbie, given by Sue Jackson of Annan. She told us about the common sense that geese display when they fly in a V formation, how the airflow over the geese’s wings helps those behind, that the leader’s position is shared, as that is the most strenuous, how if a goose drops out of formation, others will follow to give aid. 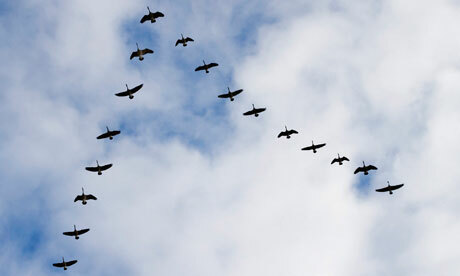 Also, that the geese at the back of the formation will ‘honk’ their encouragement to those at the front. Sue asked us to compare the V formation of the geese to how we live our lives. What kind of ‘honking’ are we doing? Here is an interesting article found on the web – well worth a read!